I finally decided to get rid of the "blogspot" and have my own domain for this blog. 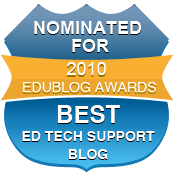 I figured it was only appropriate as I approach the 1 year anniversary of my first blog post. I will still maintain the same title unless something else more creative comes along, but I don't anticipate that happening, at least not anytime soon. I do anticipate changing the layout in the coming days to make it more presentable and more web like and less blog like....I guess. 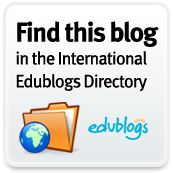 So you can now find this blog at http://www.edutechintegration.com. If you subscribe to this blog, it might be worth checking to make sure that the RSS feed still works and you are still receiving posts to this blog...I mean website..I mean blog...you get the point. Thanks to everyone who has been a loyal reader or occasional visitor through this first year and journey with me.